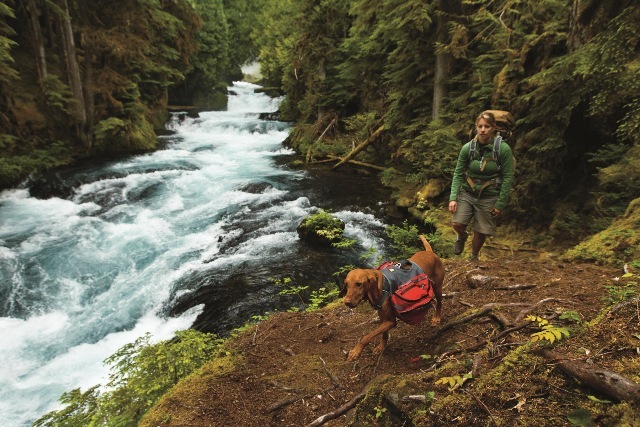 Ruffwear Performance Dog Gear is on a mission. That mission is to build performance product to enhance and inspire outdoor adventures for dogs and their human companions. Ruffwear combines technology, quality, fit, function, and safety to meet the needs of active and adventurous canines and their humans. Check out the information below to guide you in selecting a dog-pack that is right for your four-legged companion. Most trail-sized dogs have tremendous power-to-weight that gives your dog the ability to carry its own food, water, and credit cards on a day hike or overnight trek. But there are some guidelines you need to consider when you decide to invest in a pack for your dog. Ruffwear offers some good, common sense ways to outfit your dog with its own saddle bags. What size pack should I order for my dog? Ruffwear packs are designed to fit based on your dog’s girth measurement. We find that all dogs are unique and finding the right sized pack for your canine companion is important. Size down to ensure a snug fit. If your pup is in-between sizes, sizing down is recommended. If the pack is too large, it can cause shifting and a less-than-ideal fit. Adjust the pack to fit comfortably over the shoulders. Ruffwear packs are designed to position the majority of the weight forward, rather than in the middle of their back. This allows the strong parts of your dog’s frame to support the weight inside. You can adjust the front martingale on all of our packs to find the best fit for your dog’s shape. How much weight should I load into my dog’s pack? The total weight of your canine’s pack should not exceed 25-percent of their body weight. Be sure to load both sides of your dog’s pack equally. Keeping the saddlebag load balanced will minimize on-trail adjustments and provide a more stable load for your dog to carry. If you are using our Ruffwear Palisades Pack, use the built-in compression straps. Along with the general weight of the pack, these straps will compress the gear inside leaving more room for weaving through the trees and over rocks. 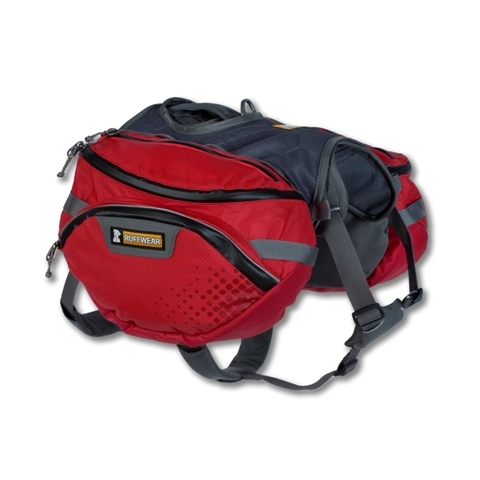 Multi-day adventures made possible with expansive capacity, forward-positioned, weight conscious saddlebags. Refined design makes the Palisades Pack even lighter while maintaining its innovative features and long-term durability.